Chances are you might not be getting enough sun every day. Vitamin D supplementation may help support nutrient absorption, hormonal function, immune function, and reducing inflammation. 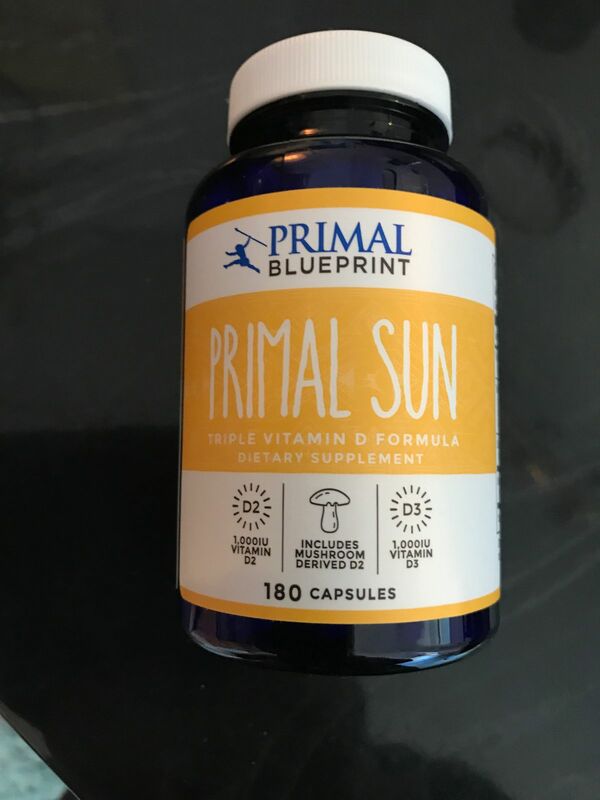 Primal Sun is a pure and potent source of Vitamin D that offers the protection you need. Other Ingredients: microcrystalline cellulose, cellulose gum, stearic acid. For adults, take one (1) to two (2) capsules daily, preferably with a meal. It’s hard to keep up with my own health when caring for four boys under 5 years old, so being able to take one/day makes life much simpler than some options. Kristin W. Reviewed by Kristin W.
I was so happy to find this at such a reasonable price. vitamin D is such a struggle at our house, especially in the winter months. Thanks again for a great product and peace of mind! Kathy G. Reviewed by Kathy G.
I feel this is a great product because of the Vitamin D that’s in it. Although this is a large pill it is still easy to swallow. Richard E K. Reviewed by Richard E K.
Raised my Vitamin D level taking this. Gloria D. Reviewed by Gloria D.
I wanted to wait to see what my blood work results were before reviewing. The range is 30.0 - 100.0 ng/mL. My number came in at 72.5 so my doc was pleased. He said many of his patients are at the 30 range (don't know what age or health status) but I'm glad I'm not that low. My number in 2018 was 60.9 and I ditched my otc D and started taking Primal Sun. You can see the increase in the number so I am glad I found this product. How much vitamin D do I need per day? Since 2010, the recommended daily allowance of vitamin D has fallen between 400 and 800 IU per day, but new research suggests adults may actually need at least 2,000 IU of vitamin D every day, and the best source of vitamin D is from the sun! It is estimated that the human body is able to produce 10,000 IU to 20,000 IU of vitamin D3 from as little as 30 minutes of sun exposure. However, the majority of adults do not get even 30 minutes of regular sun exposure. Subsequently, vitamin D deficiencies are rising among all age groups in the U.S. Vitamin D food sources, such as salmon, egg yolk and raw milk, only provide around 200 IU to 400 IU of vitamin D, which is why most adults would benefit from vitamin D supplementation. Taking too much vitamin D is called vitamin D toxicity, but such a scenario is highly unlikely. You’d have to take 40,000 IU per day for a couple of months or longer to be in danger of developing vitamin D toxicity. Is it better to get sun than to take supplements? Take stock of your living situation. If the sun is pretty much a constant where you live, then opt for some actual rays whenever possible. It’s free, it’s safe, it’s easy and it’s enjoyable! For those of you who work in an office or live in a colder climate, supplementation is an easy and effective way to ensure adequate vitamin D levels. Can I get vitamin D through food? Certain foods are touted as vitamin D powerhouses: wild salmon, mackerel, herring, catfish, cod liver oil and eggs. Each of these foods is an excellent primal approach to eating, but won’t significantly enhance vitamin D levels. If your vitamin D levels fall within the danger zone (less than 40 ng/ml), then supplementation is strongly advised. How long does vitamin D stay in the body? It’s believed that when taken orally vitamin D has a half-life of one month. Because excess vitamin D is stored in fat, some vitamin D can remain in the body for an extended period of time to be used during months when access to the sun is limited, such as the winter season. It maintains optimum potency for up to 18 months. How do you manufacture vitamin D3? Vitamin D3 is manufactured by irradiation of 7-dehydrocholesterol from lanolin (from sheep's wool) and the chemical conversion of cholesterol. We have found that while D3 seems to be preferred by most, some people just can't absorb it well, so we offer both forms in Primal Sun. * There is no guarantee of specific results and results can vary from person to person. However, we feel so strongly about our products that we offer a 30-day money back guarantee. Try Primal Sun today, and if you're not completely satisfied with the results, return it for a full refund minus shipping and handling—no questions asked.